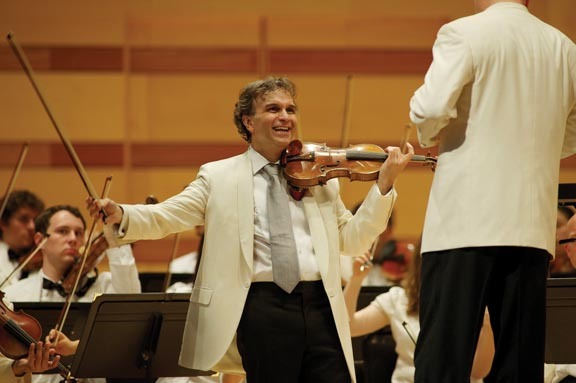 Alex Irvin photoViolinist and Aspen Music School alumnus Gil Shaham will perform at the 2011 Aspen Music Festival. ASPEN – Poets, painters, playwrights, photographers – prepare to turn your attention to music this summer. The Aspen Music Festival is presenting its 2011 summer season under the theme Art Inspires Art, with a focus on music that has ties to drama, visual art, ballet and other creative forms. But a subtext of that theme is the idea that music can convey all of the emotions and thoughts found in artistic expression. Concertgoers will get plenty of opportunity to consider the relative merits of the various arts, with a season-long immersion in music inspired by other art. The first performance by the Aspen Chamber Symphony, on July 1, will feature Mendelssohn’s complete incidental music to “A Midsummer Night’s Dream,” inspired by the Shakespeare romance; and the first concert by the Aspen Festival Orchestra, on July 3, will include Strauss’ “Don Quixote,” based on the Cervantes novel. Other works exploring the theme include Debussy’s piano piece “Clair de lune,” inspired by poems by Verlaine; and Ravel’s orchestral version of Mussorgsky’s “Pictures at an Exhibition,” a piano composition intended to convey the experience of touring through an art collection. One non-musician gets particular focus in the Music Festival season. Entire segments of the summer will be devoted to a musical exploration of Shakespeare. In addition, a two-week segment of the festival, from July 30 to Aug. 14, will emphasize how Shakespeare’s stories and sonnets have provided inspiration to composers. Among the performances are an Aug. 8 collaboration with the Aspen Santa Fe Ballet on “Romeo and Juliet”; and the Aug. 12 world premiere of a commissioned work by composer Andrew Norman, based on Shakespeare sonnets, and performed by the Aspen Chamber Symphony. Also on the schedule: the Aspen Festival Orchestra, conducted by Robert Spano, performing Sibelius’ Overture from “The Tempest” and John Knowles Paine’s Overture to “As You Like It”; and performances of Shostakovich’s Incidental Music to “Hamlet”; Walton’s Music from “Richard III”; and a song recital by soprano Jennifer Zetlan and tenor Paul Appleby, of settings of Shakespeare texts. Festival highlights outside the theme include violinist Gil Shaham performing, in four separate programs, four concerti composed between 1931 and 1939; the Jupiter String Quartet performing the complete Beethoven string quartets over six concerts; the Aspen debut of composer, pianist and singer Gabriel Kahane; a solo recital by bassist Edgar Meyer, centered around Meyer’s own compositions; a pair of Baroque evenings featuring Nicholas McGegan and Daniel Hope; and, in collaboration with Jazz Aspen Snowmass, a concert by the Jazz at Lincoln Center Orchestra, led by conductor-trumpeter Wynton Marsalis. Others scheduled to appear include conductors David Robertson, Leonard Slatkin and Marin Alsop; pianists Joseph Kalichstein, Jean-Yves Thibaudet, Joyce Yang, Orli Shaham and Jeremy Denk; violinists Sarah Chang, Robert McDuffie and Julia Fischer; cellists David Finckel and Alisa Weilerstein; and ensembles the Takacs Quartet and Emerson String Quartet. The 2011 Music Festival will run June 29 to Aug. 21, with more than 300 events scheduled. For a more detailed preview of the season, go to aspenmusicfestival.com.